Many business professionals and teams are stuck in an all too relatable rut; they don’t have the time it takes to nurture mutually beneficial, long-lasting relationships. This is due to the amount of time wasted on tracking down customer information and sales data in siloed Word, Excel, or Powerpoint documents. How do you get ahead in today’s over-communicated, data-driven business world? The solution is simple — you implement a CRM software. If you are like many other business people, you might be unclear on the basics and benefits of a CRM tool. Customer Relationship Management (CRM) software helps to keep track of customer interactions, contact information, customer information (including social media profiles, business insights, etc. ), sales process data, customer support histories, and more. CRM (or cloud based CRM) software effectively supports business teams as they nurture mutually beneficial connections with key prospects, sales leads, and existing customers. The right CRM also helps business and sales teams strategize marketing campaigns, optimize customer service efforts, and managing their sales processes and funnels. They’re perfect for individuals and teams managing their contact information and sales pipelines within spreadsheets, email, on social media, or on scattered sticky notes. After transitioning to a CRM, teams are able to focus on selling more, quickly connecting with more prospects, and optimizing internal processes. If your team also has an Office 365 subscription, your CRM can also integrate with your most loved Office apps — you won’t even have to change your existing workflow to start driving better results. Many teams aren’t aware of the many benefits CRM systems provide — or how to use one, for that matter. With the right know-how, a CRM can benefit everyone within a company, big or small — not just sales teams. CRM software allows marketers and salespeople to manage, track, and optimize relationships with existing and potential customers. Teams can stay on top of every customer interaction within a unified system of records the entire company can access. With a CRM, the marketing and sales team always know who their customers are and can identify areas for potential follow up efforts. This makes the interaction more personalized, increases the chances of conversion, and nurtures long-lasting relationships. The software offers automation of tedious day-to-day tasks, sets reminders for important calendar events or email follow-ups, and provides social insights on your customers and prospects to help you effectively engage –everywhere you work. Some CRMs also offer analytics and reporting, allowing you to track the efficiency of your outreach efforts to generate leads and conversions. CRM software (in combination with marketing automation and Office 365 applications), provides business teams with the ability to manage multiple sales and marketing funnels — from lead qualification to relationship management, forecasting, and deal closure. How Does a CRM Support Small Business Teams? Small business is oftentimes unstable and unpredictable. Small business teams risk encountering a number of competitors in almost any niche (unless you are based in a small community and serve only local customers). If you are a small business owner who plans to thrive in a highly competitive market, you should continue to optimize the quality of your customer service and the interactions your sales team engage in to make people want to purchase your product or service. The key to maintaining a positive reputation among existing and potential customers is to deliver mutually beneficial customer interactions, optimizing your marketing automation and marketing campaigns, and creating a finely tuned sales process. Moreover, exemplary customer service doesn’t end after the purchase is made – it is no less important to provide the customers with a flexible discount system, regular notifications about new products and special offers, and customer support if needed. What Types of Companies Use CRMs? What type of company benefits from a CRM system? Long story short, the answer is any company that strives to make interaction with customers better. Both B2B and B2C companies can reap the benefits of CRM software. B2B companies usually aim to obtain loyal customers and build stable partnerships. B2C companies react to customers’ requests as fast as possible and process huge amounts of data every day. Many business teams have already invested in a CRM system, and know all too well that the right solution helps optimize relationship management and unify disjointed company contact databases. Considering the added benefits of integrating with G Suite and Microsoft, teams turn into relationship-managing powerhouses. Despite the benefits, there are still many businesses who have yet to leverage the power of a CRM solution. This could be due to cost and/or lack of resources, or lack of support from senior management decision makers. Knowing the impressive ROI and key benefits of CRMs helps to persuade the naysayers in your company to invest the time and money in a CRM tool. What a CRM Do for Your Organization? The initial cost of the CRM software, upkeep, development, and the fundamental training for your business team versus the increase in overall performance validate the investment of a CRM. A CRM solution is proven to increase the results of teams’ outreach efforts and customer retention. 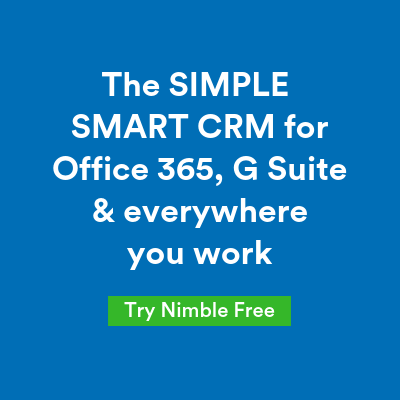 Many CRMs (including Nimble) work within your existing Office 365 or G Suite apps to unify your team’s inboxes, calendars, social platforms, communication histories, and more into a single database everyone can access. Identify, record, and categorize contact information on potential customers in a quick and easy manner. All contact information (including customer interaction history) is saved in one place, making it possible to provide faster, more personalized customer service. A CRM unites all teams within a company while allowing them to optimize their department-specific duties. All contact information and deal histories are accessible in one database. CRM software can help you save time with trackable email templates that can be sent at scale. By creating segmented lists built using social intel, you can create more personalized group messaging to increase your chances of engagement. Track and manage multiple deal pipelines and sales funnels in one platform. You can use this easily scanned view of what’s in the works to analyze opportunities, create forecasts, and strategize next steps. The question is not whether you need a CRM – it’s why haven’t you implemented a CRM solution yet? What Features Should You Look For in a CRM? There are specific features you should look for in a CRM software. The specifics vary based on your industry and the size of your team, but many key features are universal. The ability to track conversation histories and customer interactions is one of the most pivotal features a customer relationship management CRM has to offer. Have no fear — it comes standard in 94% of CRM solutions available on the market. Storing all of your contact records and conversations in one place enables teams to provide faster, more effective customer support. It also enables seamless interdepartmental interaction, which improves the overall workflow of a given company. For example, Nimble’s Today Page allows you to quickly track interactions and scan your sales pipeline, calendar appointments, tasks, sales intelligence, and social signals to stay on top of priorities and work more effectively. The ability to attach documents to records within a unified system of records can significantly speed up a business team’s workflow. Some CRMs integrate with an external storage system such as Google Drive or Dropbox, while others offer their own internal storage folders. Similarly, Nimble syncs with +130 others SaaS Business Apps including Salesforce, Hubspot, Quickbooks, Zendesk, MailChimp, and more to unify you and your team’s contact records. 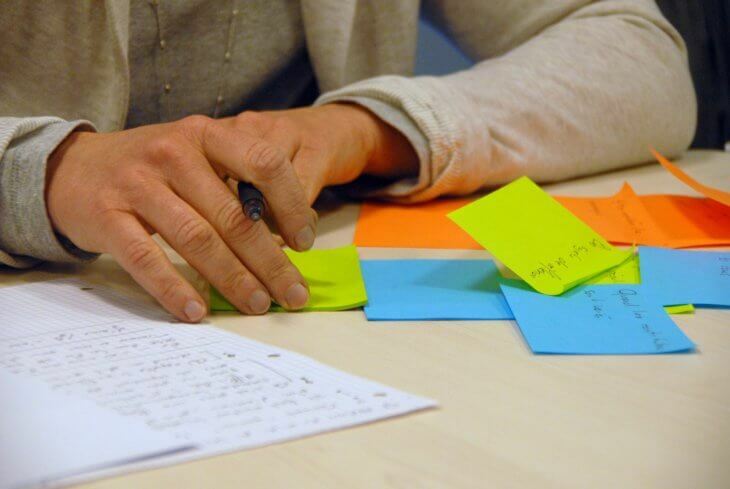 The ability to quickly scan every stage in your sales pipeline is critical in identifying areas of opportunity in your sales processes and to optimize them accordingly. How many clients are in the negotiations stage? How many potential leads end up becoming your customers? Are there any cross-selling opportunities? These statistics help you understand which stages you need to focus on improving. Want to know a nifty trick? Nimble automatically ties your team’s tasks, events, and communications to each deal to ensure everyone is on the same page with each of your customer interactions and opportunities. When a team account is created within a CRM solution, whoever started the account will become the administrator by default. Select the most logical administrator to set up your CRM account before getting started. For most CRMs, the administrator will be the point of contact that will receive bills, own financial information, create licenses, select users, and set authorization level. 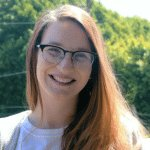 If you or another teammate have accidentally been assigned as the account administrator for your contact relationship manager CRM, it’s typically an easy fix to switch roles. Are you sold, yet? If you’re ready to pull the trigger on a high quality, budget-friendly CRM, we strongly recommend (surprise!) Nimble. Its cost doesn’t exceed $25 per user/month. As for its functionality, it has everything you need for customer service, marketing automation, accounting services, sales pipeline management, and more. You can easily integrate this CRM with other software you already use (including your Office 365 or G Suite apps) with the help of APIs. Visit our FAQ to learn more about Nimble CRM benefits for business.